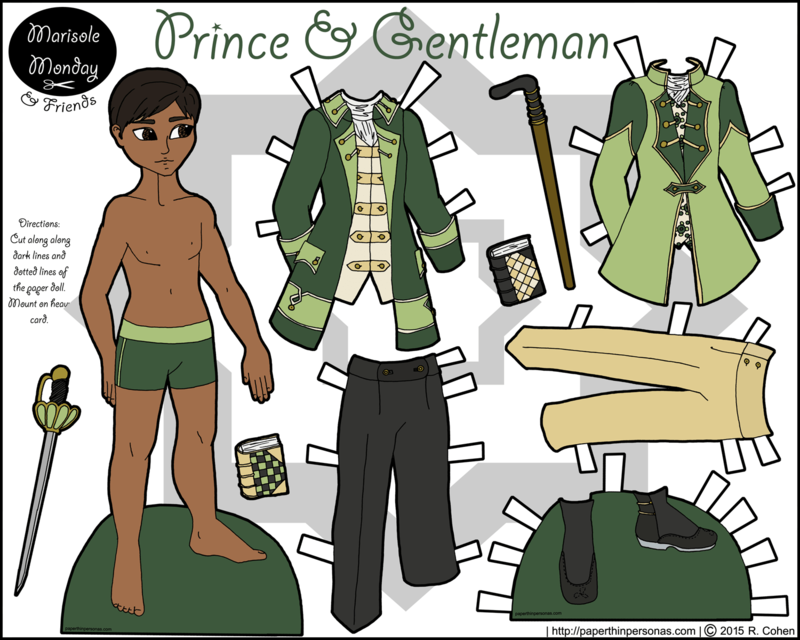 At the moment, I am trying to get inspired to give the male paper dolls some love. I am trying to convince myself that male clothing is as interesting as female clothing. I am trying to develop the same interest drawing for guys as I do for girls. I realize that a lot of it is in my head. I don’t think I’m good at drawing males and my insecurity makes it hard to want to try. Usually, I think of drawing male paper dolls as something I do “for my readers” and not something I do for myself. This is a line of reasoning that I am trying to stop using. Drawing things for other people is, for me, a fast road to burn out. No one keeps up a blog like this for as long as I have by doing it “for other people”. Trust me. You have to do it for yourself. But I also want to challenge myself. I also want to try things that I have never tried. I want to create things that I have never created. I want to stretch and do things that scare me a little. So, male paper dolls it is. One of the nice things about green is that I don’t find any of the shades really horrid. I mean, there are shades of yellow I think are awful and shades of orange that I don’t like either, but green and blue are pretty much all okay with me. So, a green prince to match, I suppose, my yellow and my pink princesses. Thank you, I love the color green. It is the color of nature. Thank you LadyBug and Cisco. I’m pleased with the green too. For some reason this color scheme was a complete surprise to me but it is very calm and beautiful. Yes, there is something soothing about green, isn’t there? I wouldn’t have chosen the color myself, but the suggestion was an excellent one. Green seems to be a color that many men favor, so it’s nice that you chose shades of green for his clothes. It’s great to see a male paper doll once in a while. Thanks for doing them even if it’s not your favorite.